Place half of the yogurt in bottom of 8-oz glass or small canning jar. Sprinkle half of the granola over yogurt in glass. Top with half of the raspberries. 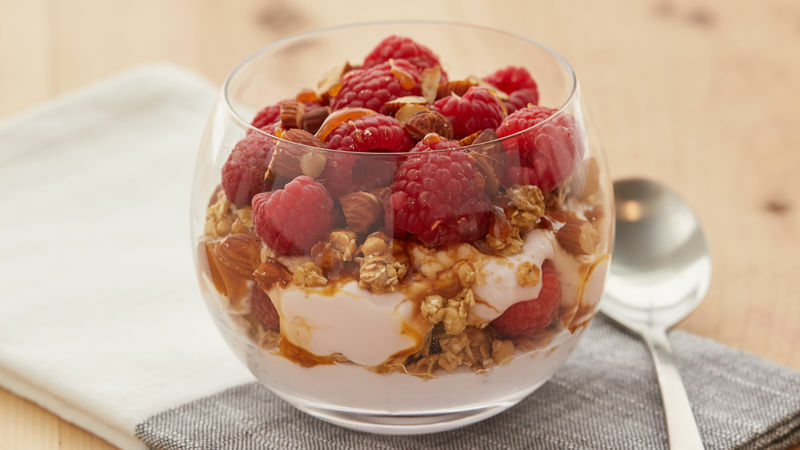 Top with remaining yogurt, granola and raspberries. Place caramel topping in small microwavable bowl. Microwave uncovered on High 5 to 15 seconds or until warm and thin enough to drizzle. Drizzle over parfait. Top with almonds. Serve immediately. Don’t have any caramel topping? This parfait is still decadent and delicious without it. Canning jars, stemless wine glasses and clear low tumblers all make great vessels for this parfait.